10 seeds sent with growing notes. Wodyetia is prized by landscapers for its thick, robust trunk and neat appearance, especially the arching crown of light green fronds which, as the name suggests, gives the palm's foliage the appearance of a fox's tail as it sways in the breeze. Its wonderful smooth self cleaning trunk is very low maintenance. Full sun to part shade. Foxtail palms are exceptionally hardy and easy to grow. Quite cyclone proof due to deep roots. They tolerate a wide variety of well drained soils, including alkaline limestone soils and rocky sands. Mulch well (but keep mulch away from the trunk to prevent collar rot). Fertilise in spring/summer with an organic fertiliser such as manure. Regular fertilization and watering result in rapid growth. 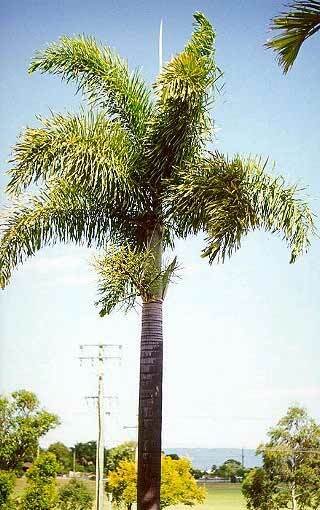 Fertilizer for foxtail palm should have ample amounts of micronutrients and slow release potassium. The foxtail growth rate has been documented to be 0.6-0.9 m/year under good conditions. Foxtail palms tolerate light frost, rarely attract pests and disease, and are resistant to lethal yellowing. Foxtail palm grows naturally amongst rocks and boulders in northeastern Australia, specifically in northeastern Queensland, in the Melville Range, near Bathurst Bay on the Cape York Peninsula. So they like loose, sandy, granitic soils. The climate in this area of Australia is tropical with a prolonged dry season. During cooler months the foxtail palm needs only occasional watering. Care should be taken not to overwater foxtail palms that are grown in containers.